Objective To assess the impact of exercise referral schemes on physical activity and health outcomes. Data sources Medline, Embase, PsycINFO, Cochrane Library, ISI Web of Science, SPORTDiscus, and ongoing trial registries up to October 2009. We also checked study references. Study selection Design: randomised controlled trials or non-randomised controlled (cluster or individual) studies published in peer review journals. Population: sedentary individuals with or without medical diagnosis. Exercise referral schemes defined as: clear referrals by primary care professionals to third party service providers to increase physical activity or exercise, physical activity or exercise programmes tailored to individuals, and initial assessment and monitoring throughout programmes. Comparators: usual care, no intervention, or alternative exercise referral schemes. Results Eight randomised controlled trials met the inclusion criteria, comparing exercise referral schemes with usual care (six trials), alternative physical activity intervention (two), and an exercise referral scheme plus a self determination theory intervention (one). Compared with usual care, follow-up data for exercise referral schemes showed an increased number of participants who achieved 90-150 minutes of physical activity of at least moderate intensity per week (pooled relative risk 1.16, 95% confidence intervals 1.03 to 1.30) and a reduced level of depression (pooled standardised mean difference −0.82, −1.28 to −0.35). Evidence of a between group difference in physical activity of moderate or vigorous intensity or in other health outcomes was inconsistent at follow-up. We did not find any difference in outcomes between exercise referral schemes and the other two comparator groups. None of the included trials separately reported outcomes in individuals with specific medical diagnoses. Substantial heterogeneity in the quality and nature of the exercise referral schemes across studies might have contributed to the inconsistency in outcome findings. Conclusions Considerable uncertainty remains as to the effectiveness of exercise referral schemes for increasing physical activity, fitness, or health indicators, or whether they are an efficient use of resources for sedentary people with or without a medical diagnosis. We searched the following electronic databases: Medline In-Process (Ovid) and Medline (Ovid), 1950 to October 2009; Embase (Ovid), 1980-2009, week 28; Cochrane Library (Wiley), 2009, issue 3 (Cochrane Database of Systematic Reviews, database of abstracts of reviews of effects, National Health Service economic evaluation database, and Health Technology Assessment database); SPORTDiscus, 1990 to October 2009; ISI Web Of Knowledge, 1900 to October 2009; Science Citation Index Expanded, 1900 to October 2009; and Social Sciences Citation Index, 1898 to October 2009. To maximise the specificity, we did an initial scoping search to develop “exercise referral” and other related synonym terms which we then combined with “primary care” search terms and a controlled trial filter. Studies were also sought by reviewing the bibliographies of included studies and those known to the researchers of the present study. Furthermore, we limited the search to studies in the English language and that were published from 1990 onwards. Web appendix 1 provides full details of the search strategies. Searches were updated until July 2011. We considered studies to be eligible for inclusion if they met criteria regarding study design, population, intervention, comparators, and outcomes (box). We excluded studies not published in a peer reviewed journal (for example, annual reports of exercise referral scheme programmes), editorials, opinions, and studies available only as meeting abstracts; programmes or systems of exercise referral initiated in secondary or tertiary care, such as conventional comprehensive cardiac or pulmonary rehabilitation programmes; and exercise programmes in which individuals were recruited from primary care but received no clear statement of referral by a member of the primary care team. We screened titles and abstracts in three stages. At stage 1, one reviewer (TP) initially ruled out clearly irrelevant titles and abstracts. At stage 2, two reviewers (TP and RT, KF, MH, or AT) then independently screened the remaining titles and abstracts. At stage 3, full papers of abstracts categorised as potentially eligible for inclusion were screened by a consensus meeting of least two reviewers (TP and RT, KF, MH, AT) and disagreements were resolved in real time by consensus. Data were extracted by one reviewer (TP) using a standardised data extraction form and checked by another (RT). Discrepancies were resolved by discussion, with involvement of a third reviewer if necessary. Extraction included data for patient characteristics (for example, age or disease diagnosis), intervention (for example, duration, location, intensity, and mode of the exercise intervention delivered), comparator, study quality, and reported outcomes pertinent to the review. We contacted all included study authors to seek information not available in study reports. In view of the heterogeneous nature of outcomes and variable quality of outcome reporting, the primary focus of our data synthesis was descriptive and detailed tabular summaries were presented. For a small number of outcomes, we were able to consistently extract data across studies to allow quantitative summaries using the meta-analysis. We expressed dichotomous outcomes as relative risks (95% confidence intervals) for each study. For continuous variables, we compared net changes (that is, the differences between the exercise group and control group) and calculated a weighted or standardised mean difference (95% confidence intervals) for each study. We investigated heterogeneity by reviewing the study populations, methods, and interventions; by visualising the results; and by using the χ2 test for homogeneity and the I2 statistic. A fixed effects model for the meta-analysis was used unless statistical heterogeneity was identified (χ2 test, P≤0.05, or I2≥50%), where a random effects model was used. In view of the small number of studies consistently reporting outcomes in a format to allow a meta-analysis, we were not able to undertake a funnel plot and assessment of publication bias analysis. Analyses were conducted with RevMan version 5.0. Our bibliographic search yielded 21 563 titles (fig 1⇓). After a full review of the papers, the main reason for exclusion was that studies recruited primary care individuals into exercise programmes, with no clear statement of a referral by a member of the primary care team to a third party exercise provider. Web appendix 2 provides the full list of excluded studies. In addition to the six trials that met the inclusion criteria,7 8 17 18 19 20 21 22 23 our searches identified published protocols for another two trials on exercise referral schemes.24 25 By contacting the trial authors, we were able to obtain the full unpublished trial report for one of these trials.26 Although a report of the other trial was not made fully available to us and unpublished at the time of this review, it is now available as a press release.27 We included both trials in our analysis. The eight trials (13 publications) included 5190 participants (table 1⇓). All studies were randomised controlled trials, six undertaken in the UK,18 20 21 22 26 27 one in Denmark,23 and one in Spain.8 Various geographical locations in England and Wales were provided for the UK based studies. Trials mainly recruited sedentary, middle aged, white adults who had no medical diagnosis but had evidence of at least one cardiovascular risk factor (that is, high blood pressure, raised serum cholesterol, smoking, or being overweight). In those trials that recruited a proportion of individuals with diabetes, hypertension, depression, coronary heart disease, or obesity, only aggregated outcomes across all trial participants were reported, restricting the use of subgroup analyses to determine effectiveness of exercise referral schemes within specific populations. All trials generated a random allocation sequence although details of concealment were poorly reported (table 2⇓). All trials reported good balance between groups in participant characteristics at baseline. Although blinding of participants and intervention providers was not feasible, the Jolly and Murphy studies reported outcome blinding.26 27 For both studies, self reported physical activity using the seven day physical activity recall was assessed via telephone by researchers blinded to group allocation. The reporting and handling of missing data were detailed for most studies, and all studies apart from one18 reported the use of intention to treat analyses. The level of missing data at follow-up ranged from 17% to 50%. Most studies used imputation methods (that is, the last observation carried forward or the average of complete case values) to replace missing data values at follow-up. Overall, three studies were judged to be at moderate overall risk of bias (Taylor,18 Harrison,21 and Stevens20) and five at a low overall risk of bias (Gusi,8 Isaacs,22 Jolly,26 Sorensen,23 and Murphy27). We reported outcome results according to the three categories of comparator group: usual care, alternative exercise interventions (or alternative physical activity interventions), and exercise referral schemes plus behaviour change interventions (or alternative exercise referral schemes). All studies, with the exception of the Gusi study,8 relied on a self report measure of physical activity. No studies assessed physical activity using objective methods. The most consistently reported physical activity outcome across studies was the proportion of individuals achieving 90-150 minutes of activity of at least moderate intensity per week (table 3⇓).28 After pooling data across studies, we found a 16% (95% confidence intervals 3% to 30%) increase in the relative risk of achieving this outcome with exercise referral schemes, compared with usual care, at 6 to12 months’ follow-up (fig 2, using denominators as reported by the study authors⇓). The Taylor and Harrison studies reported this outcome based on the number of individuals who were available at follow-up.18 21 To assess the potential (attrition) bias in using completers, we adjusted the denominators of these two studies to all individuals undergoing randomisation. 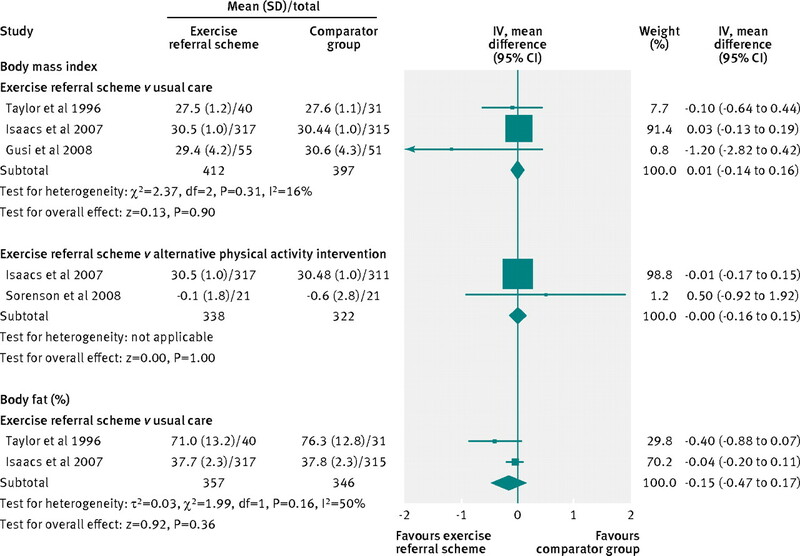 Assuming that all missing cases did not meet the physical activity threshold, we found that exercise referral schemes no longer differed significantly from usual care (fig 2, using denominators adjusted to all randomised groups). Jolly and colleagues reported that the proportion of patients achieving at least 150 minutes of moderate physical activity per week increased in the standard exercise referral scheme group from 27% at baseline to 63% at three months and 46% at six months, compared with the group participating in the referral scheme plus behaviour change intervention.26 However, we did not see a difference between the groups in these proportions (fig 2). Taylor and colleagues reported a lower percentage of body fat in exercise referral scheme participants than in the usual care group at follow-up.18 However, overall there was no difference between the two groups in body mass index or body fat (fig 4⇓). There was also no between group difference in diastolic or systolic blood pressure (fig 5⇓), serum lipids (web table 2), and respiratory function (web table 4) at follow-up. In this systematic review of eight randomised controlled trials (5190 participants), we found weak evidence of a short term increase in physical activity and a reduction in levels of depression of sedentary individuals after participation in an exercise referral scheme compared with usual care. 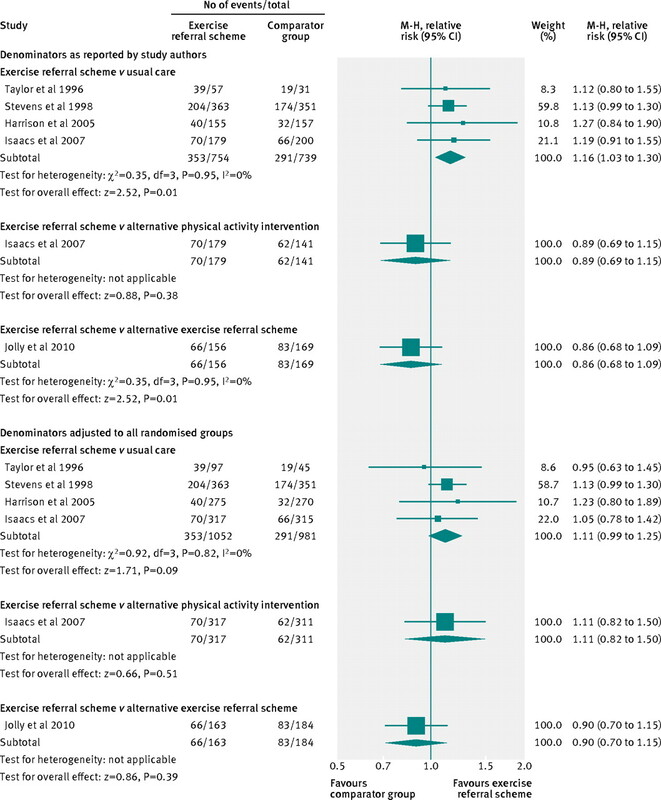 We did not find consistent evidence in favour of exercise referral schemes in outcomes based on physical fitness, psychological wellbeing, overall health related quality of life, blood pressure, serum lipid levels, indices of obesity, glycaemic control, or respiratory function. In addition, we found no difference in any outcomes when comparing an exercise referral scheme with an alternative physical activity intervention (for example, walking programmes) or with schemes plus an additional behavioural intervention. Although several trials included individuals with a pre-existing medical diagnosis (for example, hypertension, myocardial infarction, and depression), because outcomes were not separately reported for such individuals, we were unable to judge the effectiveness of an exercise referral scheme in these subgroups. We made every effort to reduce potential bias in this review. We used comprehensive electronic searches, including the searching of reference lists of included studies, and used predefined inclusion criteria which were applied by consensus across two or more reviewers. We carefully selected exercise referral scheme studies on the basis that there was a clear statement of referral of participants by a primary care health professional to a third party exercise provider. The referral process of the scheme is, in itself, a key motivator and driver for individuals to take up and adhere to exercise interventions.29 Although this approach resulted in the exclusion of several trials investigating exercise intervention in primary care (for example, Elley,30 Lamb,31 Harland32, and Munro33), it allowed us to focus on the effectiveness of exercise referral schemes themselves. We found several potential biases in the included trials. The methodological detail of trials was often poorly reported, in respect of allocation concealment and outcome blinding, and subsequently we saw potential for selection and assessment bias. With the exception of self reported physical activity, we found limited consistency in the collection and reporting of alternative outcomes across trials. Finally, we found considerable evidence of heterogeneity in the nature of exercise referral scheme interventions across studies, which could have contributed to the inconsistency in outcome findings. We found weak evidence of a short term increase in physical activity and reduction in the levels of depression of sedentary individuals after participation in an exercise referral scheme (typically a 10-12 week, leisure centre based programme) when compared with usual care. We did not find consistent evidence to support the benefit of exercise referral schemes for other outcomes (for example, health related quality of life). 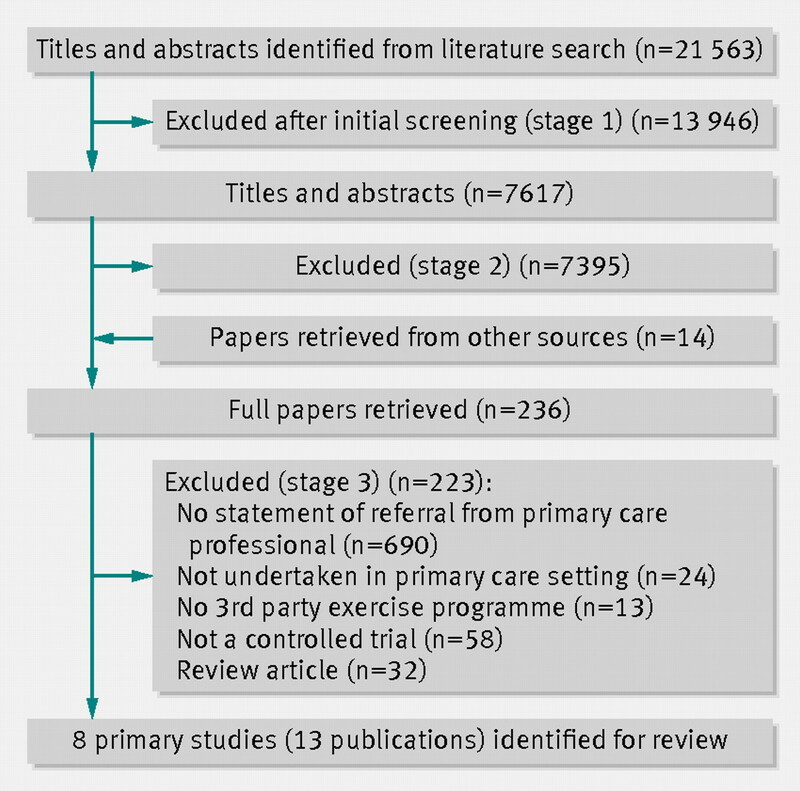 In view of this limited evidence, exercise referral schemes remain a potentially valuable primary care intervention for promoting physical activity. Particularly, since outcomes were not separately reported for individuals with a pre-existing diagnosis, we were unable to judge the effectiveness of an exercise referral scheme in these subgroups. High quality, randomised controlled trials are still needed to incorporate theory driven approaches to behaviour change (such as self determination, goal setting) and compare the outcomes and costs of exercise referral schemes with alternative, primary care based interventions that promote physical activity5, especially involving individuals with a pre-existing medical condition. Contributors: TGP coordinated the review, with RST (guarantor) and AT as principal investigators. TM developed the search strategy, in consultation with TGP, RST, AHT, KRF, and MH, and undertook the searches. TGP, RST, AHT, KRF, and MH screened abstracts and full papers against the inclusion criteria. TGP appraised the quality of the papers and abstracted data from them. TGP and RST analysed the data and drafted the review. All authors, including the Project Advisory Group (NA, JLC, CF, CG, NM, JS, PT) provided input to interpretation of findings, commented on various drafts of the chapters, and contributed to their editing. Funding: This project was funded by the National Institute for Health Research Health Technology Assessment (NIHR HTA) programme (project number 08/72/01) (www.hta.ac.uk/). Competing interests: All authors have completed the Unified Competing Interest form at www.icmje.org/coi_disclosure.pdf (available on request from the corresponding author) and declare: TGP, AHT, KRF, MH, PT, and RST have support from NIHR HTA for the submitted work; JS is chief medical officer of the Fitness Industry Association, which meets his receipted expenses, but the post attracts neither a salary nor fees; no non-financial interests that may be relevant to the submitted work. Department of Health. At least five a week. Evidence on the impact of physical activity and its relationship to health. A report for the Chief Medical Officer. DH, 2004. US Department of Health and Human Services. Physical activity guidelines for Americans. 2008. www.health.gov/paguidelines/pdf/paguide.pdf. HSE. Health Survey for England—2008: physical activity and fitness. Summary of key findings. DH, 2009. Fox K, Biddle S, Edmunds L, Bowler I, Killoran A. Physical activity promotion through primary health care in England. Br J Gen Pract1997;47:367-9. National Institute for Clinical Excellence. Four commonly used methods to increase physical activity: brief interventions in primary care, exercise referral schemes, pedometers and community-based exercise programmes for walking and cycling. NICE, 2006. British Heart Foundation National Centre. A toolkit for the design, implementation and evaluation of exercise referral schemes. Guidance for referring health professionals, exercise referral professionals and exercise referral scheme commissioners. www.bhfactive.org.uk/sites/Exercise-Referral-Toolkit/. Sorensen JB, Kragstrup J, Kjaer K, Puggaard L. Exercise on prescription: trial protocol and evaluation of outcomes. BMC Health Serv Res2007;7:36. Gusi N, Reyes MC, Gonzalez-Guerrero JL, Herrera E, Garcia JM. Cost-utility of a walking programme for moderately depressed, obese, or overweight elderly women in primary care: a randomised controlled trial. BMC Public Health2008;8:231. Morgan O. Approaches to increase physical activity: reviewing the evidence for exercise-referral schemes. Public Health2005;119:361-70. 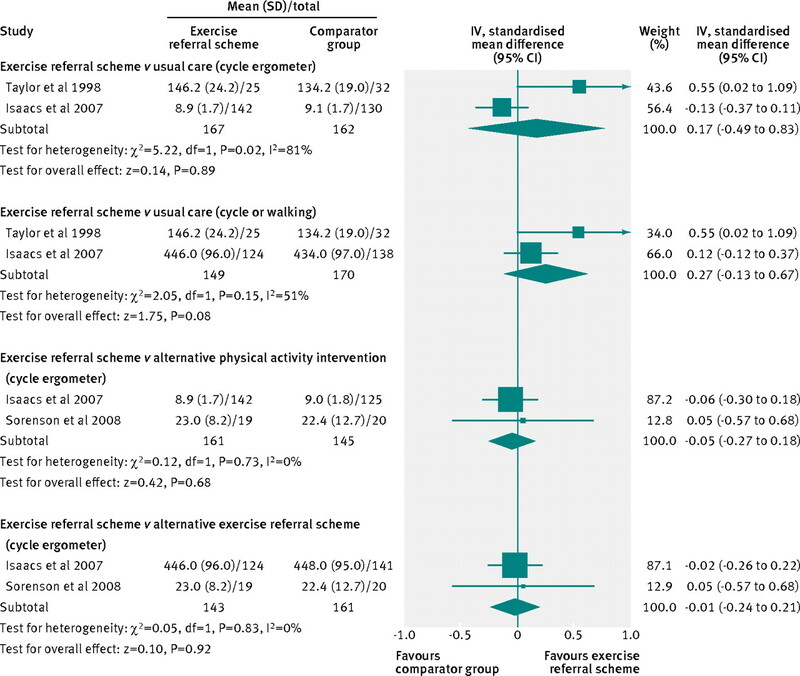 Williams N, Hendry M, France B, Lewis R, Wilkinson C. Effectiveness of exercise-referral schemes to promote physical activity in adults: systematic review. Br J Gen Pract2007;57:979-86. National Institute of Health and Clinical Excellence. A rapid review of the effectiveness of ERS to promote physical activity in adults. NICE, 2006. Sorensen J, Skovgaard T, Puggaard L. Exercise on prescription in general practice: a systematic review. Scand J Prim Health Care2006;24:69-74. Pavey T, Anokye N, Taylor A, Trueman P, Moxham T, Fox KR, et al. The effectiveness and cost-effectiveness of exercise referral schemes: a systematic review and economic evaluation. 2011. www.hta.ac.uk/1815. Moher D, Liberati A, Tetzlaff J, Altman DG, the PRISMA Group. Preferred reporting items for systematic reviews and meta-analyses: the PRISMA statement. J Clin Epidemiol2009;62:1006-12. Khan K, ter Riet G, Glanville J, Sowden A, Kleijen J, eds. Undertaking systematic reviews of research on effectiveness: CRD’s guidance for those carrying out or commissioning reviews. 2nd ed. NHS Centre for Reviews and Dissemination, University of York, 2001. The Cochrane Collaboration. Cochrane handbook for systematic reviews of interventions. 2011. www.cochrane-handbook.org. Taylor AH, Fox KR. Effectiveness of a primary care exercise referral intervention for changing physical self-perceptions over 9 months. Health Psychol2005;24:11-21. Taylor A, Doust J, Webborn N. Randomised controlled trial to examine the effects of a GP exercise referral programme in Hailsham, East Sussex, on modifiable coronary heart disease risk factors. J Epidemiol Community Health 1998:52:595-601. Taylor AH. Evaluating GP exercise referral schemes. Findings from a randomised control study. University of Brighton. 1996. Stevens W, Hillsdon M, Thorogood M, McArdle D. Cost-effectiveness of a primary care based physical activity intervention in 45-74 year old men and women: a randomised controlled trial. Br J Sports Med1998;32:236-41. Harrison R, Roberts C, Elton P. Does primary care referral to an exercise programme increase physical activity one year later? A randomized controlled trial. J Public Health 2005;27:25-32. Isaacs A, Critchley J, Tai S, Buckingham K, Westley D, Harridge S, et al. Exercise evaluation randomised trial (EXERT): a randomised trial comparing GP referral for leisure centre-based exercise, community-based walking and advice only. Health Technol Assess2007;11:1-185. Sorensen JB, Kragstrup J, Skovgaard T, Puggaard L. Exercise on prescription: a randomized study on the effect of counseling vs counseling and supervised exercise. Scand J Med Sci Sports2008;18:288-97. Jolly K, Duda J, Daley A, Eves F, Mutrie N, Ntoumanis N, et al. Evaluation of a standard provision versus an autonomy promotive exercise referral programme: rationale and study design. BMC Public Health2009;9:176. Murphy S, Raisanen L, Moore G, Edwards R, Linck P, Williams N, et al. A pragmatic randomised controlled trial of the Welsh National Exercise Referral Scheme: protocol for trial and integrated economic and process evaluation. BMC Public Health2010;10:352. Jolly K, Duda JL, Daley A, Ntoumanis N, Eves F, Rouse P, et al. An evaluation of the Birmingham exercise on prescription service: standard provision and a self-determination focused arm. Final Report, 2009. Murphy S, Raisanen L, Moore G, Edwards R, Linck P, Hounsome N, et al. The evaluation of the National Exercise Referral in Wales. 2010. http://wales.gov.uk/docs/caecd/research/101104nationalexerciseschemeen.pdf. O’Donovan G, Blazevich AJ, Boreham C, Cooper AR, Crank H, Ekelund U, et al. The ABC of physical activity for health: a consensus statement from the British Association of Sport and Exercise Sciences. J Sports Sci2010;28:573-91. Taylor AH. The role of primary care in promoting physical activity. In: Riddoch C, McKenna J, eds. Perspectives on health and exercise. MacMillian Press, 2003. Elley CR, Kerse N, Arroll B, Robinson E. Effectiveness of counselling patients on physical activity in general practice: cluster randomised controlled trial. BMJ2003;326:793. Lamb S, Bartlett H, Ashely A, Bird W. Can lay-led walking programmes increase physical activity in middle aged adults? A randomised controlled trial. J Epidemiol Community Health2002;56:246-52. Harland J, White M, Drinkwater C, Chinn D, Farr L, Howel D. The Newcastle exercise project: a randomised controlled trial of methods to promote physical activity in primary care. BMJ1999;319:828-32. Munro J, Nicholl J, Brazier J, Davey R, Cochrane T. Cost effectiveness of a community based exercise programme in over 65 year olds: cluster randomised trial. J Epidemiol Community Health2004;58:1004-10. Department of Health. Exercise referral systems: a national quality assurance framework. DH, 2001. Michie S, Abraham C, Whittington C, McAteer J, Gupta S. Effective techniques in healthy eating and physical activity interventions: a meta-regression. Health Psychol2009;28:690-701. Sowden S, Raine R. Running along parallel lines: how political reality impedes the evaluation of public health interventions. A case study of exercise referral schemes in England. J Epidemiol Community Health 2008;62:835-41. Limb M. Government’s plans on public health are too vague, experts say. BMJ2011;342: published online 18 February.